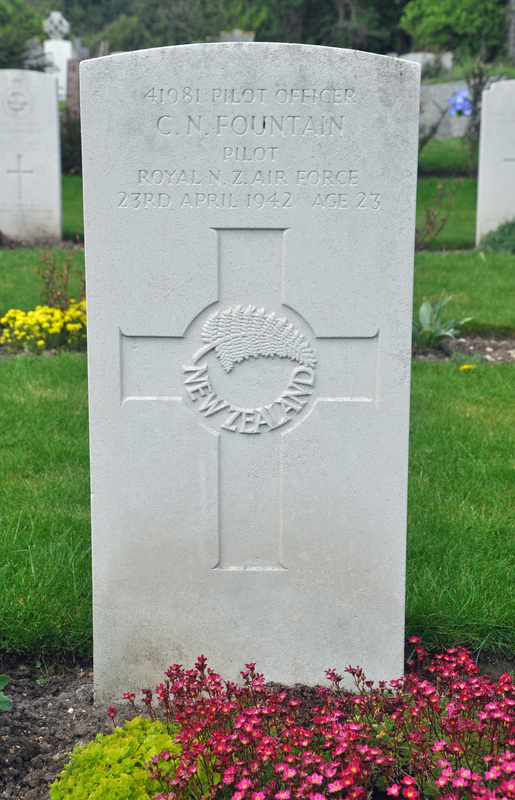 P/O Arthur James Falconer, RNZAF NZ39910 – Pilot. Lost without trace age 23 on the 21st of February 1941. Son of William Mowat Falconer and Helen Francis Falconer, of Wanganui, Wellington, New Zealand. Seven Wellington aircraft of this Unit were detailed to carry out individual bombing attacks against the above target. One of the aircraft, JAH.124, captained by P/O Falconer, failed to return to base. A mixed bomb load was carried and consisted of 1000lbs. 500lbs. 250 lbs. and containers of incendiaries. JAH.243 bombed docks at EMDEN. Incendiaries not observed; 500lbs. bombs seen to explode in target area. Owing to front and rear turrets being unserviceable, JAH.460 returned to base. Bombs were jettisoned in sea. JAH.598 reports bombs seen to explode on docks. Incendiaries seen to cause large fires. JAH.607 reports one good fire, and three minor fires. JAH.969 dropped in vicinity of target area. JAH.996 bombed on ETA and heaviest flak concentration. Bomb bursts seen under cloud. No observations were made, and no reconnaissance carried out. The A.A. fire encountered was medium and inaccurate. There were few searchlights, mostly operating in cones. No enemy aircraft were seen. There was 10/10 cloud over most of the journey, with severe icing conditions. Navigation was by D/R, W/T, map reading, pin points. P/O Arthur James Falconer, RNZAF NZ39910 – Captain. S/L Edward Ulric Guerin Solbe, RAFVR 34090 – 2nd Pilot. P/O Anthony Vincent Muir, RNZAF NZ40195 – Observer. Sgt. William Donald ‘Don’ Morrison, RAFVR 946356 – Wireless Operator. Sgt. Andrew Moore Brodie, RNZAF NZ391378 – Rear Gunner. All aircraft, except Wellington Mk.Ic T.2503, returned to base safely, landing at approximately 00.30hrs. Wellington T2503 failed to return. Very little information is available to determine the fate of the aircraft, although it became apparent it was brought down in the North Sea. The crew all perished. Two bodies were later washed ashore near Helgoland, north of Wilhelmshaven. Acting as second pilot on this ill-fated sortie, was S/L Solbe, ‘A’ Flight Commander. F/S Philip Falkiner, RNZAF NZ425140 – Rear Gunner. Lost without trace age 21 on the 30th of June 1944. Son of Mr. and Mrs. Edward Clifford Falkiner. Seventeen aircraft were detailed to take part in an early morning attack on enemy troops and armoured concentrations near Amaye-Sur-Seulles. All crews successfully attacked from a low level and reports indicate that the bombing was well concentrated and ably controlled with a gradual advance southwards as ordered. No results other than clouds of smoke were seen. One aircraft (Captain NZ42117 F/S. Nairne, C.) failed to return. F/S Colin George Nairne, RNZAF NZ42117 – Pilot. P/O Lyndon Clifford Perry, RNZAF NZ428925 – Navigator. W/O Denis Alfred Kidby, RAFVR 1391158 – Air Bomber. Sgt. Alfred Richard Stannard, RAFVR 1338510 – Wireless Operator . Sgt. Raymond Charles Smith, RAFVR 1235250 – Flight Engineer. Sgt. Stanley Alfred George Woodford, RAFVR 922095 – Mid Upper Gunner. Although formally recorded as ‘lost without trace’, the circumstances of the disappearance of HK558 was more accurately explained in ‘For Your Tomorrow’ by author Errol Martyn. A Royal Navy minesweeper on patrol in the Channel observed two Lancasters collide in mid-air at approximately 08.00hrs while HK558 was flying northwards in the base of heavy low cloud. The other aircraft was a 514 Sqn Lancaster, LL733, probably from the same raid. The Minesweeper steamed to where the two aircraft crashed into the sea, a short distance away. After an hour’s search, only the body of an RAF Air Bomber was recovered, who was buried at sea. All seven crew of each aircraft are commemorated on the Runnymede Memorial. F/S John Farnworth, RAFVR 1147012 – Navigator. Killed age 23 on the 26th of August 1944. Son of John and Sarah Agnes Farnworth, of Ingol, Lancashire. Grave location – Coll. grave 5. H. 16-18. F/S Richard Stockdale Barker, RNZAF NZ421345 – Pilot. F/S William George Norton, RNZAF NZ413227 – Air Bomber. W/O Raymond Firth, RAFVR NZ417203 – Wireless Operator . Sgt. Gordon Baden Jones, RAFVR 1892748 – Flight Engineer. Sgt. Henry George Baker, RAFVR 1814627 – Mid Upper Gunner. Sgt. Clifford George Nash, RAFVR 1654190 – Rear Gunner. Lancaster Mk.I LL866 AA-S “Swingtime” was brought down over Germany, crashing near Untereisesheim, about a mile North of Heilbronn. There were no survivors. All of the crew were buried in the Durnbach War Cemetery. Killed age 21 on the 28th of May 1944. Son of Francis Enoch Fauvel, and of Violet Annie Fauvel, of Wellington City, New Zealand. Lost without trace age 31 on the 4th of November 1943. Son of George Fawcett and of Annie Fawcett (Nee Goodrick), of Stratford, Taranaki, New Zealand. Sgt. Derek Richard Fawcett, RAFVR 755949 – Rear Gunner. Killed age 21 on the 15th of September 1941. Wellington Mk.Ic X.9918, AA-U was probably brought down by flak, near Hartenholm, about 24 miles North of Hamburg. Two crew members, Sgt R Robert Blakeway and Sgt W.Mullins RAF, successfully baled out and were taken prisoners of war. The rest of the crew were killed. Killed age 21 on the 24th of August 1943. Son of Miltion John and Margaret May Fear, of Tredegar, Gwent. Grave location – 1. J. 13. Sgt. Andrew James Feenan, RAF 632983 – Mid Upper Gunner. Lost without trace age 24 on the 8th of March 1943. Son of Andrew and Mary Ellen Feenan; Husband of Annie Shannley Feenan, of South Queensferry, West Lothian. Grave location – Panel 143. F/S John Fellows, RCAF 78046 – Mid Upper Gunner. Killed age 23 on the 17th of December 1942. Son of James Percy and Ethel May Fellows, of Toronto, Ontario, Canada. Grave location – Coll. grave 8. L. 15-18. F/S Henry Edwin Rousseau, RAFVR 1026535 – Pilot. Sgt Mervyn Oliver Clark, RNZAF NZ404895 – Navigator. Sgt. Reginald Crosby Mocock , RAFVR 1168876 – Air Bomber. Sgt. 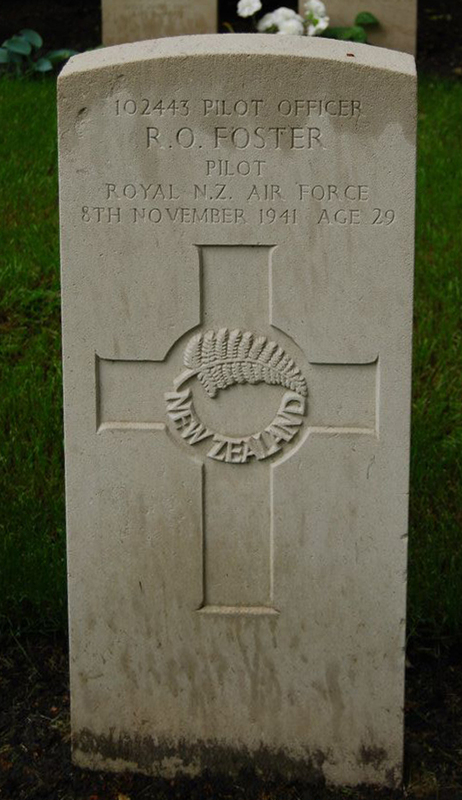 Christopher James Kendall , RNZAF NZ412342 – Wireless Operator. Sgt. Morton W.W., RAFVR – Mid Upper Gunner. Sgt. John Fellows, RAFVR R.78046 – Mid Upper Gunner. Sgt. Pullar Henry Welsh Pullar , RNZAF NZ411777 – Rear Gunner. Stirling Mk.I R.9247 AA-W was brought down near Vechta airfield, 30 miles South West of Bremen, Germany, while en route to or from the target. None of the crew survived the crash. All are buried in the Reinberg Cemetery. F/S Allister Archibald Fergusson, RNZAF NZ425391 – Mid Upper Gunner. Lost without trace age 22 on the 22nd of May 1944. Son of Hugh Archibald and Olive Muriel Fergusson, of Titoki, Auckland, New Zealand. Grave location – Panel 264. Twenty five aircraft took off to attack Duisburg, of which twenty one attacked the primary target. Three returned early with various technical failures and one failed to return (Captain NZ421803 P/O. W. Willis). Another aircraft (Captain AUS413157 P/O. A. Humphreys) was attacked by an enemy fighter and the navigator 1438903 F/Sgt. Hill, A. was injured, the aircraft also being damaged. 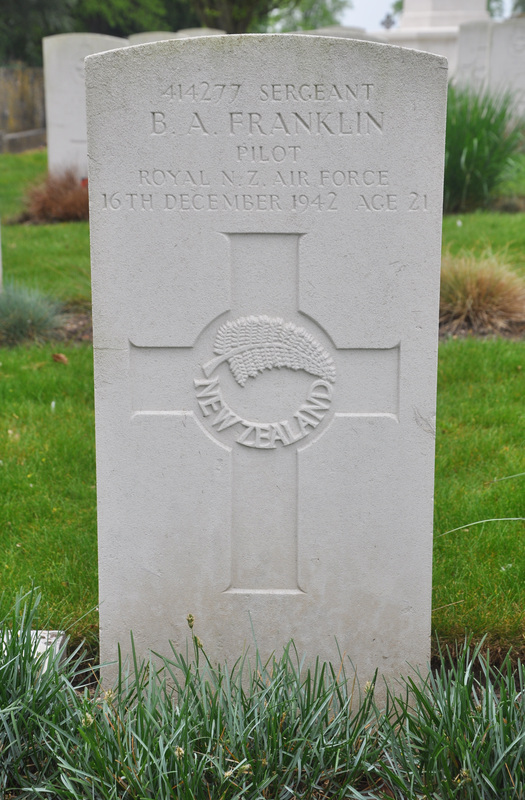 P/O William Jarvis Willis, RNZAF NZ421803 – Pilot. F/S Russell Howard Brown, RNZAF NZ425444 – Navigator. F/S Alan Lister Kay, RNZAF NZ42299 – Air Bomber. F/S Stanley Albert ‘Hank’ Hancock, RAFVR 1396104 – Wireless Operator . Sgt. Donald Rimmer, RAFVR 1495443 – Flight Engineer. F/S Allister Archibald Ferguson, RNZAF NZ425391 – Mid Upper Gunner. Sgt. William Ferguson ‘Billy’ Reid, RCAF R.178421/ J.89732 – Rear Gunner. ND804 was lost without trace. All crew members are commemorated on the Runnymede Memorial. Lost without trace age 23 on the 24th of October 1940. Son of John Herbert Mcwilliam Finlayson and Hilda Kathleen Finlayson (Nee Benton), of Opoho, Dunedin, Otago, New Zealand. Grave location – Panel 27. Killed age 19 on the 13th of October 1942. Son of Ernest John Firth and of Gladys Mary Firth (Nee Collins), of Wellington City, New Zealand. Grave location – 3. F. 3. 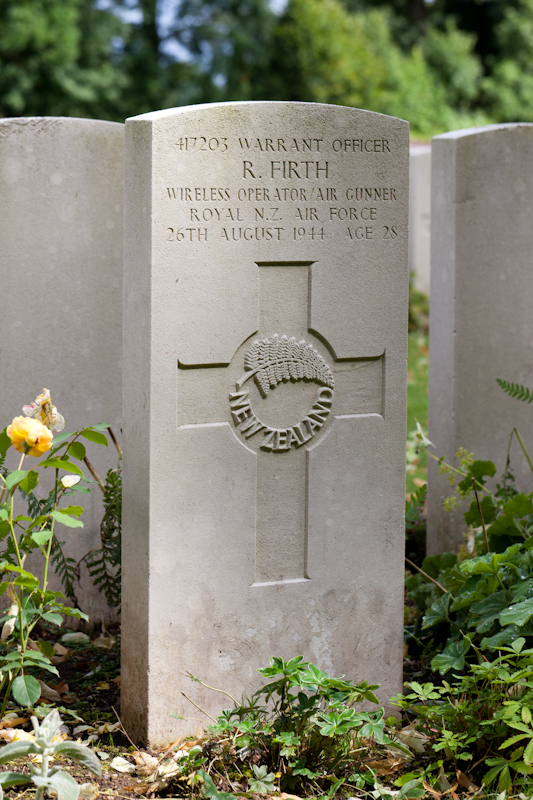 W/O Raymond Firth, RNZAF NZ417203 – Wireless Operator. Killed age 28 on the 26th of August 1944. Son of Alexander Charles and Julia Annie Firth, of Wanganui, Wellington, New Zealand. Grave location – 5. H. 14. F/S Joseph George Arkless Fisk, RNZAF NZ412874 – Air Bomber. Killed age 28 on the 1st of September 1943. Son of Joseph Fisk and of Fanny Fisk (Nee Shannon), of Wanganui, Wellington, New Zealand; Husband of Amelia Fisk, of Wanganui. Grave location – Coll. grave 8. L. 7-17. F/S George Vincent Helm, RNZAF NZ416113 – Pilot. F/S Donald Mackay Stewart, RNZAF NZ421366 – Navigator. Sgt. Arthur John Bishop, RAFVR 1271480 – Wireless Operator. Sgt. Oliver McCoo, RAFVR 1365426 – Flight Engineer. Sgt. G.T. Buglass, RAFVR 645313 – Mid Upper Gunner. Sgt. Frederick Thomas John Harries, RAFVR 1358765 – Rear Gunner. Stirling Mk.III EH905, AA-R was reported to have been struck by at least one bomb, dropped from an aircraft flying at a higher level over the target area. The damaged aircraft came down near Ludwigsfelde-Heide, 18 miles south-south-west of Berlin. All crew except the two Air Gunners died and were buried initially in a collective grave in the Russian Prisoner of War Cemetery near where the aircraft crashed. They later were re-interred in the Berlin 1939-1945 War Cemetery. Sergeants Moore and Harries were captured and spent the rest of the War as Prisoners of War. F/S John Fitzgerald, RNZAF NZ424777 – Air Bomber. Lost without trace age 23 on the 30th of August 1944. Son of James and Margaret Woodburn Fitzgerald, of Port Chalmers, Otago, New Zealand. Fourteen aircraft took off as detailed to attack Stettin and thirteen of these successfully bombed the target with the aid of markers. A good concentration of fires developed and all crews reported a successful raid. A.A. opposition was moderate and enemy fighters were active on the outward route. Three of our aircraft had combats, two being inconclusive but the third (Captain NZ428797 .P/O. J. Scott) claimed one enemy aircraft as probably destroyed. The aircraft captained by 1323677 .F/S. King, D., failed to return. F/S Douglas Arthur Severn King, RAFVR 1323677/ 183954 – Pilot. F/S Walter Davis Watson, RNZAF NZ428918 – Navigator. Sgt. Charles Burton Hill, RAFVR 1372387 – Wireless Operator . Sgt. John Patrick Callan, RAFVR 1777282 – Flight Engineer. Sgt. Derrick Leonard Desmond Moon, RAFVR 1626105 – Mid Upper Gunner. Sgt. Herbert William Causley, RAFVR 1199994 – Rear Gunner. 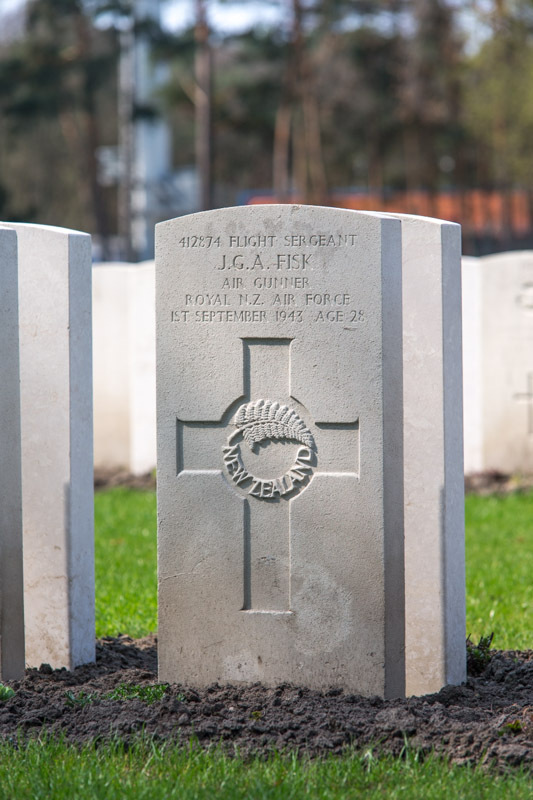 P/O Maurice Isidore Joseph Fitzgerald, RAFVR 176576 – Air Bomber. Killed age 20 on the 28th of May 1944. Son of Maurice and Mary Fitzgerald, of Bitterne, Southampton. Son of Thomas and Eva Fleming, of Opotiki, Auckland, New Zealand. F/S Andrew Crawford Fletcher, RNZAF NZ42675 – Rear Gunner. Son of Daniel Fletcher and of Jeanie Fletcher (nee McNeill), of Devonport, Auckland, New Zealand; husband of Dorothy May Fletcher, of Devonport, Auckland. 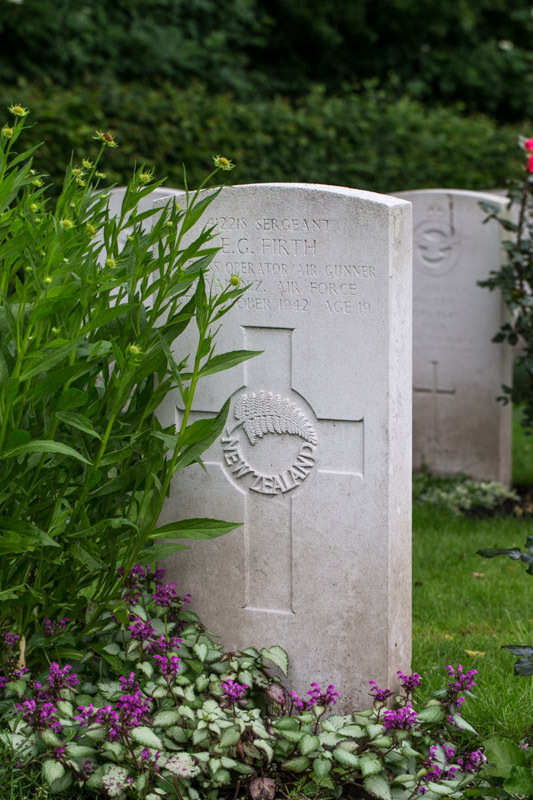 Buried Uden War Cemetery, Holland. .
W/O Harold Whittington, RNZAF NZ42488 – Pilot. F/O Joseph Stevens, RAFVR 125607 – Navigator. Sgt. Alfred Alexander Simpson, RNZAF NZ425112 – Air Bomber. 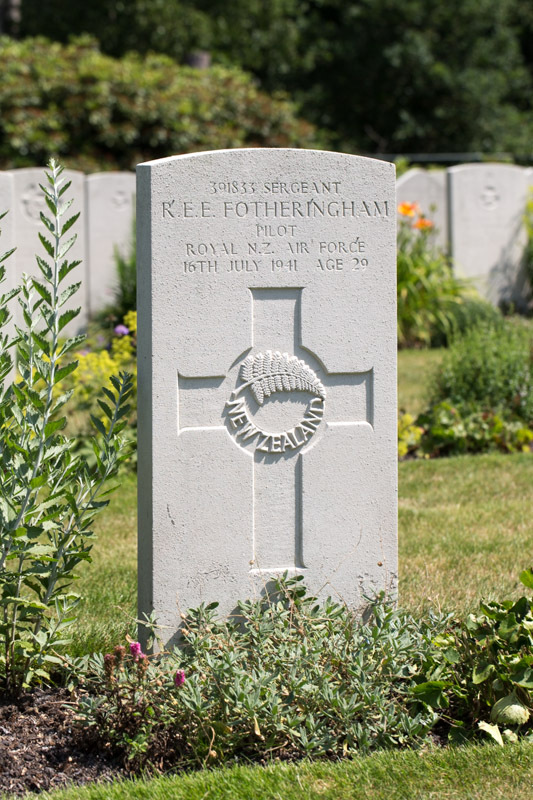 P/O Phillip Edwin Tompkins, RAFVR 157922 – Wireless Operator . Sgt. D. W. Gore, RAFVR 1624691 – Flight Engineer. Sgt. Ronald John Morton Batty*, RAFVR 548542 – Mid Upper Gunner. * ORB for this Op lists Sgt. Leslie De’Lungo, RAFVR as Mid Upper Gunner, however the recorded loss of Sgt. Batty clearly identifies this as an error. Lancaster Mk.I ME691 AA-R was brought down by an enemy aircraft at 01:33hrs beside a road near Veghel (Noord Brabant), 4 miles South West of Uden. 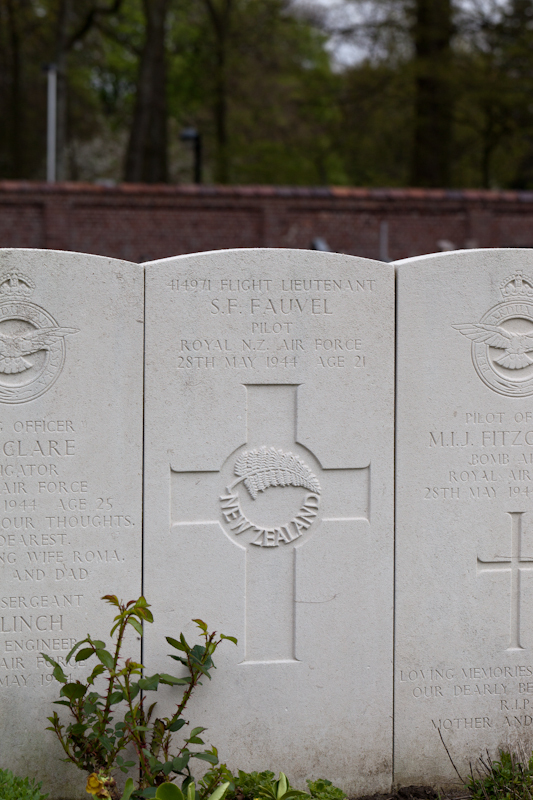 All but the flight engineer perished in the crash and were buried in the local War Cemetery, Uden. Sgt Gore, the flight engineer, survived but was taken as a P.o.W. Sgt. 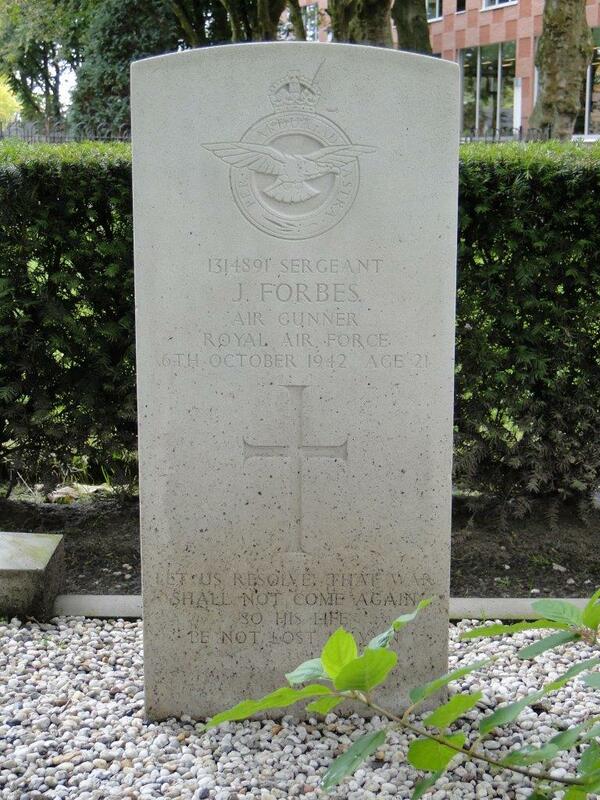 John Forbes, RAFVR 1314891 – Rear Gunner. Killed age 21 on the 6th of October 1942. Son of Edward Morris Forbes and Mabel Harriett Forbes, of Wandsworth, London. Buried Hardenberg Protestant Cemetery, Holland. Grave location – Row A. Grave 12. Fourteen aircraft were detailed to attack the above target. Bomb load of 4,000 lb. and incendiaries were dropped in the target area. Scattered fires were seen, flares were lighting up the whole area. Considerable light and heavy A.A. fire was encountered. Searchlights were numerous and operating mainly in cones. The weather was good with low cloud and slight haze at target area. Navigation was good bt D.R. , T.R. visual, pinpoints, loop and fixes. Wellington DF639 captained by Sgt. Rhodes G.W. failed to return. Sgt. George William Rhodes, RAFVR 1331658 – Pilot. Sgt. Walter John Howes, RAFVR 1378338 – Observer. Sgt. John Foreman, RCAF R.80334 – Wireless Operator. Sgt. Geoffrey Slater, RNZAF 1287890 – Front Gunner. Wellington Mk.III DF.639 was shot down by an enemy night-fighter at 23:30hrs near the small town of Hardenberg (Overijssel), 70 miles East of Amsterdam, Holland, while returning to base following the raid on Osnabruck. The crew were all killed. They are buried in the Protestant Cemetery, at Hardenberg. 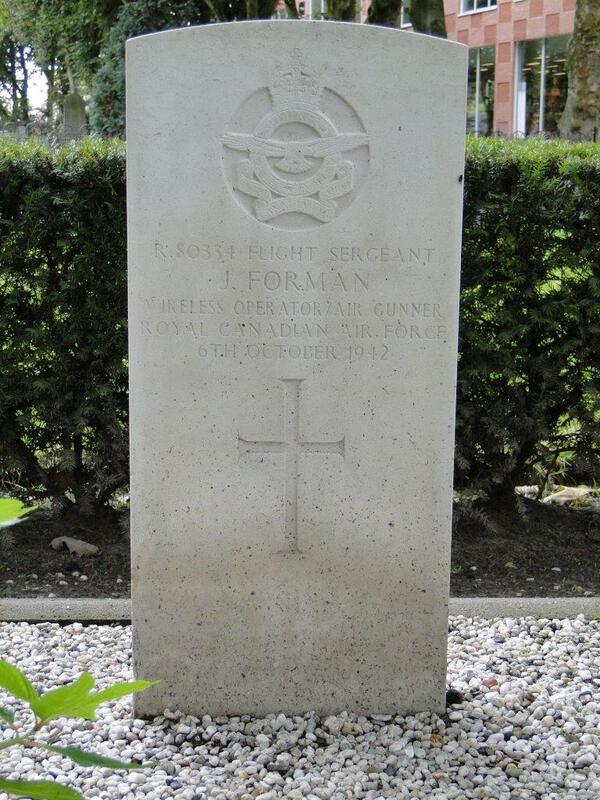 F/S John Forman, RCAF.80334 – Front Gunner. Killed age 21 on the 6th of October 1042. Grave location – Row A. Grave 11. Killed age 19 on the 20th of November 1944. Son of James Edward and Gladys Forrester, of Bootle, Lancashire. Grave location – 25. G. 3. 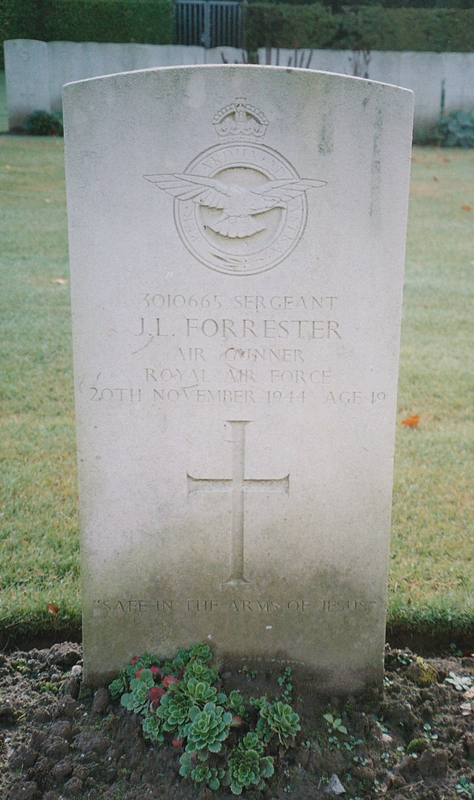 P/O Ralph Owen Foster, RNZAF NZ402443 – 2nd Pilot. Killed age 29 on the 8th of November 1941. Son of Ralph and Gladys Foster, of Christchurch, Canterbury, New Zealand. Buried Rotterdam (Crooswijk) General Cemetery, Holland. . Grave location – Plot LL. Row 1. Joint grave 14. Eleven Wellington Ic aircraft were detailed to carry out the above attacks from this Unit. Three aircraft, X.9628, captained by Sgt. Smith, X.9977, captained by Sgt. Nunn, and Z.8942 captained by Sgt. Wilson failed to return to base. Many large fires were started with resultant explosions and bursts were observed across a built up area. A railway junction south of target was also successfully attacked. Much heavy and light flak was experienced and heavy concentrations of searchlights were active in target area. Several enely aircraft were seen at target but no attacks were made. Weather was moderately clear to target but haze 5/10ths to 9/10ths over target area. Navigation was very good. Sgt. John Stephen Wilson, RNZAF NZ402530 – Pilot. P/O Robert Leslie Owen Ryder, RAAF AUS.404626 – Observer. Sgt. James Henry Reid, RAFVR 997006 – Wireless Operator. Sgt. Sir Charles Thomas Hewitt Mappin, RAFVR 1380356 – Front Gunner. Sgt. Lawrence Beresford Hamilton Hope, RNZAF NZ40940 – Rear Gunner. Killed age 29 on the 16th of July 1941. Son of John and May Fotheringham, of Takapuna, Auckland, New Zealand. Grave location – 30. A. 3. Killed age 20 on the 15th of September 1941. Son of Peter Gifford Foulkes and Violet Agnes Foulkes, of Sidmouth, Devon. P/O Cedric Niel Fountain, RNZAF NZ41981 – 2nd Pilot. Killed age 23 on the 23rd of April 1942. Son of Victor Stagg Fountain and Annie Fountain, of Napier, Hawke’S Bay, New Zealand; Husband of Betty Louise Fountain, of Napier. Grave location – Row C. Grave 10. Ten Well.III a\c were detailed attack the above targets. Bomb load of 4000lbs, 100lbs, 500lbs, 250lbs, 30lb and 4lb incendiaries was dropped in the target area but no results seen owing to cloud. There were only a few searchlights active and A.A. fire was slight. Well.III, X3487 captained by P/O Jarman was attacked by a JU.88 which attacked once and broke away to port. The results of this short attack were however serious the second pilot, P/O Nicol being mortally wounded, the rear gunner Sgt. Harris being killed and the Navigator Sgt. Taylor and W/Op. Sgt. Fernie were wounded. The bomb load was not dropped on the target but was dropped in the sea. The a/c was brought back to base and crash landed. F/S Ivor John McLachlan, RNZAF NZ404390 – Pilot. Sgt. Philip Frederick Hoare, – Observer. Sgt. Jack William Walters, RNZAF NZ404106 – Wireless Operator. Sgt. Alfred George Edward ‘Butch’ Pugh, RNZAF NZ404096 – Front Gunner. Sgt. Desmond Stewart Tutty, NZ404576 – Rear Gunner. Well.III, X3705, captained by F/S. McLachlan, was also attacked and the second pilot killed (P/O. Fountain) and Sgt. Tutty was wounded. F/Sgt. McLachlan managed to reach base and crash land. Sgt. Peter Douglas Fowler, RAFVR 1320278 – Rear Gunner. Killed age 19 on the 23rd of January 1943. Son of George Alfred and Kathleen Ann Fowler, of Tolworth, Surbiton, Surrey. Buried St.Thegonnec Communal Cemetery, France.. Grave location – Plot 2. Row 1. Grave 4. Nine aircraft were detailed to attack the above target with bombs of 1,000 lb. 500 lb. and 4 lb. incendiaries. This was a very successful and concentrated attack. All aircraft reported that their bombs were seen to fall in the target area. Large fires were seen to be lighting up the whole area. A fair amount of heavy, medium and light flak was encountered, only a few searchlights were seen. A few enemy aircraft were seen, but no combats took place. The weather was very clear at the target and good visibility. Navigation was by D.R., T.R., pinpoints and visual. Stirling I R9248 captained by Sergt. R.M.Kidd failed to return. Sgt. Robert Miln Kidd, RNZAF NZ412700 – Pilot. Sgt. James William Schofield, RAFVR 1088089 – Navigator. Sgt. Bernard Torrance, RAFVR 1319178 – Air Bomber. Sgt. Eric Berry, RAFVR 1380078 – Wireless Operator. Sgt. Gilbert Frank Mitchell, RAFVR 1479975 – Flight Engineer. Sgt. James Edward Brewster, RAFVR 1035972 – Mid Upper Gunner. Stirling Mk.I R9248 AA-H was hit by AA fire shortly after bombing, causing catastrophic damage. The captain attempted a crash landing at St Thégonnec (Finistère), about 8 miles South East of Morlaix, France. All but one of the crew died in the crash and were laid to rest in St Thegonnec Communal Cemetery. Sgt Kidd escaped slightly injured from the wreck and managed to evade capture. Sgt. Ernest Fox, RAFVR 957199 – Wireless Operator. Lost without trace age 20 on the 14th of July 1941. Son of John and Lillian Emily Fox, of Erdington, Birmingham. Grave location – Panel 43. Eleven Wellington aircraft were detailed to carry out the above targets. One of the aircraft, X.9634, captained by Sgt. Miniken was climbing on course when, apparently without warning, the starboard engine cut at 6000 feet. He turned for base but lost height rapidly and force landed near the beach off Corton near Lowestoft. Sgt. Miliken and Sgt. Gilding (Navigator) were rescued but the others are missing. The weather was poor, there being 10/10 cloud over target and results were not observed. Severe icing conditions were also experienced. Fairly heavy and accurate A.A. fire was encountered on route and in target area. Few searchlights were in operation. Sgt. Frederick Thomas Miniken, RAFVR 903047 – Pilot. P/O John Trelawney Leacock, RAFVR 62295 – 2nd Pilot. Sgt. Gilding, RAFVR – Navigator. Sgt. Frederick Joseph Edward Price, RAFVR 1355067 – Front Gunner. Sgt. Henry Paul Clarkson, RAFVR 1376787 – Rear Gunner. Wellington X9634, flown by Sgt Miniken, suffered a failure of the starboard engine without warning at 6,000ft, when climbing out on course after take off. The captain levelled out and reversed heading for base but the heavy aircraft lost height rapidly. He carried out an emergency ditching in the sea off Corton, near Lowestoft. Only Sgt Miniken and his second pilot, Sgt Gilding, were rescued from the water two hours later. All other crew members remained missing, feared drowned. Sgt. 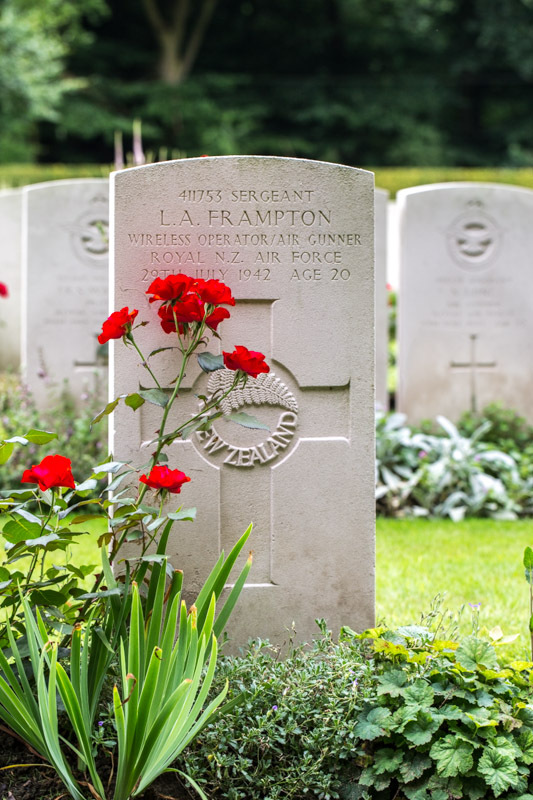 Laurie Albert Frampton, RNZAF NZ411753 – Front Gunner. Killed age 20 on the 29th of July 1942. Son of Harold Albert and Helen Frampton, of Invercargill, Southland, New Zealand. Grave location – Joint grave 15. E. 8-9. Sgt. Arthur Grahame Johns, RNZAF NZ41907 – Pilot. Sgt. Mark Kraljevich, RNZAF NZ403458 – Observer. Sgt. Ronald Ellis, RAFVR 1186850 – Wireless Operator. Sgt. Leslie Ian Stewart, RNZAF NZ411785 – Rear Gunner. Wellington Mk.III Z.1570 AA-B crashed near the small town of Lingen, 130 miles South West of Hamburg and close to the Netherlands border. It may have been attacked by a night- fighter either en route to the target or on its way back to base. Whatever the situation, Sgt. Johns the captain, was unable to maintain control and a crash landing became inevitable. It was not survivable and all crew members died. They were initially buried at Lingen- on-Ems, but later transferred to Reichswald Forest Cemetery. Sgt. 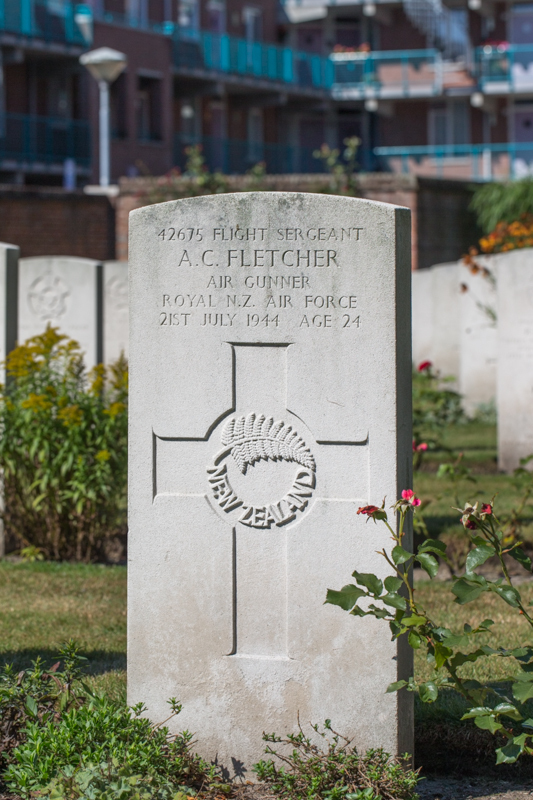 Alan John Francis, RAFVR 1815847 – Rear Gunner. Killed age 19 on the 17th of May 1943. Son of Edwin John and Clara Winifred Francis, of Shrewsbury. Buried Shrewsbury General Cemetery, Shropshire, England.. Grave location: Extn. Plot 10. Grave 297. At 01.00 hours on the 17th May 1943, Sergeant L.C.Wright was carrying out a cross country fight in Stirling Mk.1 BF398, when the starboard outer and port outer engines failed. The aircraft lost height and the Captain ordered the crew to bale out, this included a passenger AC1 BAILEY, R.G. Of the crew who baled out, all landed safely with the exception of Sergeant A.J.Francis, who was reported missing and found four days later. The Captain remained at the controls, as the aircraft was in the vicinity of the Town of STOKE-UPON-TRENT and it appears that rather than crash land over the town, he attempted to land in the nearest field, the aircraft crashed however, and he was killed. The MAYOR of STOKE-UPON-TRENT has been in communication with the Squadron, and expressed his admiration, shared also by the townspeople, for the gallantry displayed by Sergeant L.C. WRIGHT. Sgt. Benjamin Allan Franklin, RNZAF NZ414277 – Pilot. Killed age 21 on the 16th of December 1942. Son of Philip and Henretta Franklin, of Mount Eden, Auckland City, New Zealand. Buried Newmarket Cemetery, Suffolk, England.. Grave location – Plot P. Grave 434. Nine aircraft were detailed to carry out the above operation with 1500lb. vegetables. The take-off was rather cross wind and unfortunately during take-off the wind backed severely so that the flare path was dead cross wind. Three aircraft swung violently on take-off. Then Sergeant Franklin tried to take-off in Stirling I, R9245, it swung as violently as the other aircraft, but went on, straightened and got airborne, only to crash a mile away from the aerodrome. Two mines exploded and all of the crew were killed. It later transpired that the starboard under carriage carried away the oil tank to the starboard inner engine and this is presumed to have seized, causing the aircraft to spin into the ground. No other aircraft took off after this. The three aircraft who successfully took off all planted their vegetables in the allotted area. Some light tracer and a few searchlights were encountered, no enemy aircraft were seen. The weather was variable with heavy rain and hail storms over the garden area, but clear generally. Navigation was good. Sgt William Henry Whitcombe, RNZAF NZ41561 – Navigator. Sgt. Edgar William Harvey, RNZAF NZ41902 – Air Bomber. Sgt. Harold Rangi Welch, RNZAF NZ41709 – Wireless Operator. Sgt. William Joseph Lawrence, RCAF R.70294 – Flight Engineer. Sgt. Eric James Burbridge, RAFVR 1392526 – Mid Upper Gunner. Sgt. 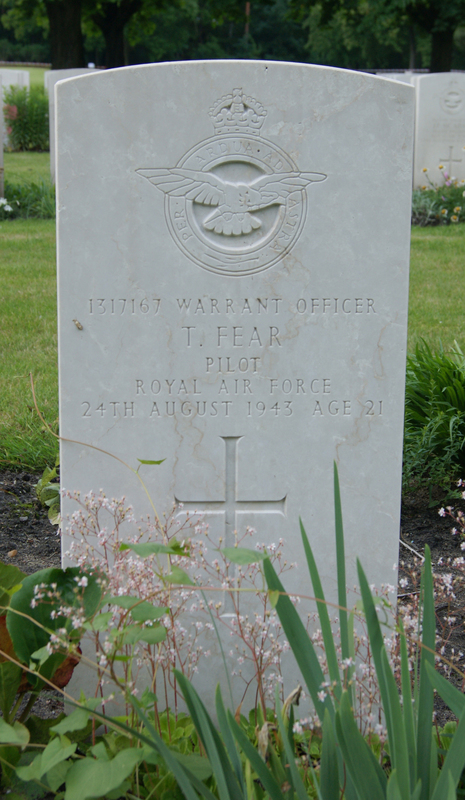 Tom Pascoe, RAFVR 1308491 – Rear Gunner. 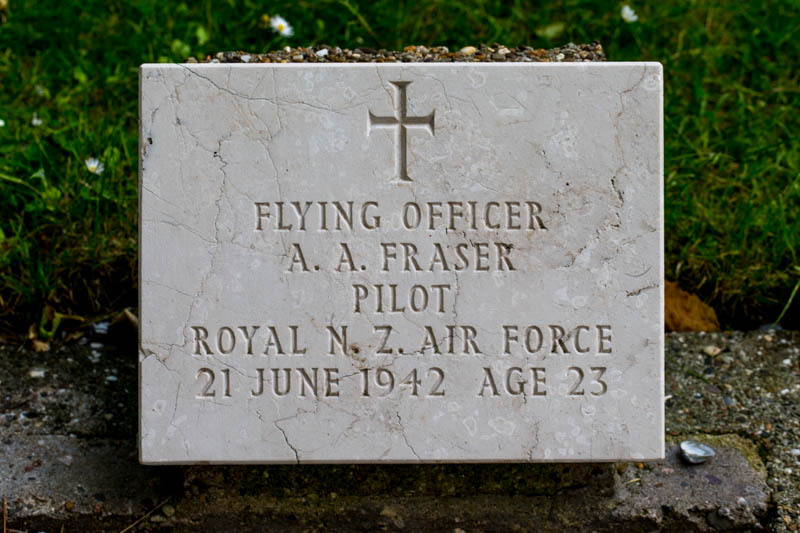 F/O Allen Armistice Fraser, RNZAF NZ405030 – Pilot. Killed age 23 on the 21st of June 1942. Son of Alexander Errol Millar Fraser and Mary Agnes Fraser, of Christchurch, Canterbury, New Zealand; Husband of Elizabeth Joan Fraser, of Wairoa, Hawke’S Bay, New Zealand. Buried Schiermonnikoog (Vredenhof) Cemetery, Holland. . Grave location – Grave 74. Twelve a/c were detailed to attack the above target. Bomb load of 4000lbs, 250lbs and 4lb inc was dropped in the target area. Results were not observed. There was intense flak and searchlights were few. A JU88 attacked Well.III, X3539 without result. Weather was hazy with 5/10 cloud. Visibility very bad. Nav was good. Well.III, X3760 P/O Fraser failed to return. P/O Allen Armistice Fraser, RNZAF NZ405030 – Pilot. P/O Wallace Edward Buckley, RNZAF NZ391379 – Navigator. F/S Arthur Stafford Christie, RNZAF NZ402982 – .Wireless Operator. Sgt. Clifton Robert Brailley, RNZAF NZ404587 – Front Gunner. P/O Raymond Wickliffe John Trengrove, RNZAF NZ40927 – Rear Gunner. Whilst the exact fate of X.3760 is not known, it is almost certain that the aircraft was shot down by a German night-fighter, crashing into the sea west of Ameland, near the Frisians. There were no survivors. The front gunner, Sgt Brailey, was lost without trace and is commemorated on the Runnymede Memorial. The bodies of the other four were eventually washed ashore and are buried near where they were found. 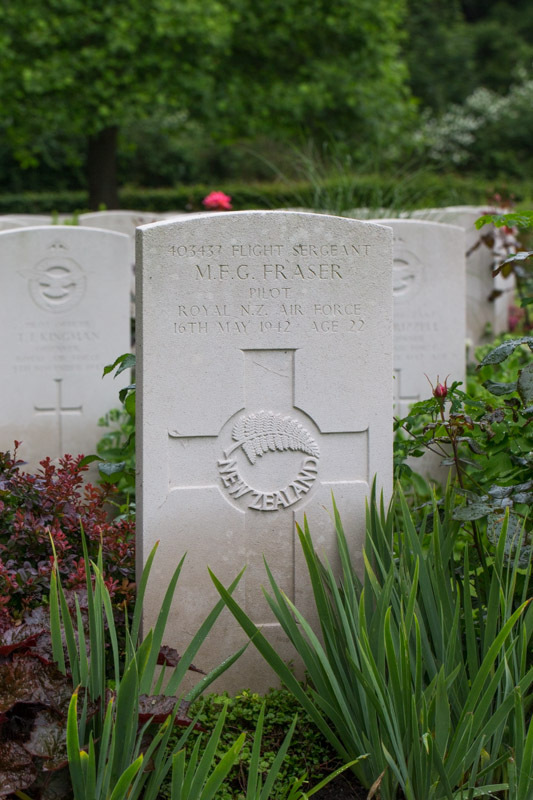 F/S Myles Frederick Gordon Fraser, RNZAF NZ403437 – Pilot. Killed age 22 on the 16th of May 1942. Son of Mrs. R. T. Fraser, of Auckland City, New Zealand. Grave location – 3. E. 10. Eight Wellington aircraft were detailed from this Unit to carry out the above operations. One aircraft, X.3482, captained by F/S. Fraser, failed to return to base. Vegetables were sown successfully and bombs were dropped on shipping in the vicinity. In accurate flak from flak ships was encountered. The weather was fine throughout the whole operation. Navigation was by D/R. Astro, TR, loop. F/S Albert Ivan Smith, RNZAF NZ402221 – Observer. Sgt. John Owen Henry Nichols, RAFVR 1257377 – Wireless Operator. Sgt. Stanley Alfred George Shaw, RNZAF 1166184 – Front Gunner. Sgt. Norman Edward Whiting, RNZAF NZ404107 – Rear Gunner. The presence of enemy ‘flak’ shipping in Kiel Bay was a clear indication that Wellington Mk.III X.3482 AA-J probably received AA fire of sufficient intensity to cause serious handling difficulties for the pilot and crew. The aircraft subsequently came down in the sea off the North Frisian Islands, near the Island of Sylt. All the crew perished. Their bodies were later recovered and laid to rest in Westerland Friedhof. After the war their bodies were taken to the Kiel War Cemetery. Sgt. 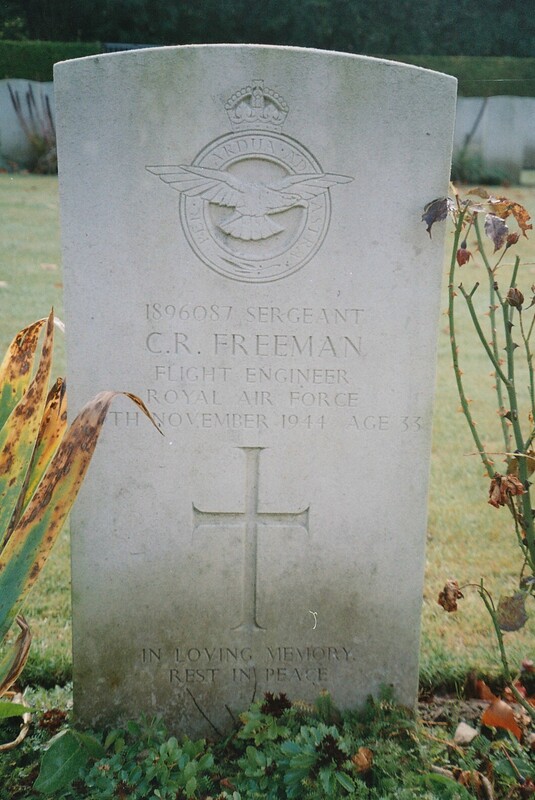 Carl Robert Freeman, RAFVR 1896087 – Flight Engineer. Killed age 33 on the 20th of November 1944. Son of Charles Lewis Freeman and Anne Freeman; Husband of Rosa May Freeman. of Streatham, London. Grave location – 25. G. 5. Sgt. 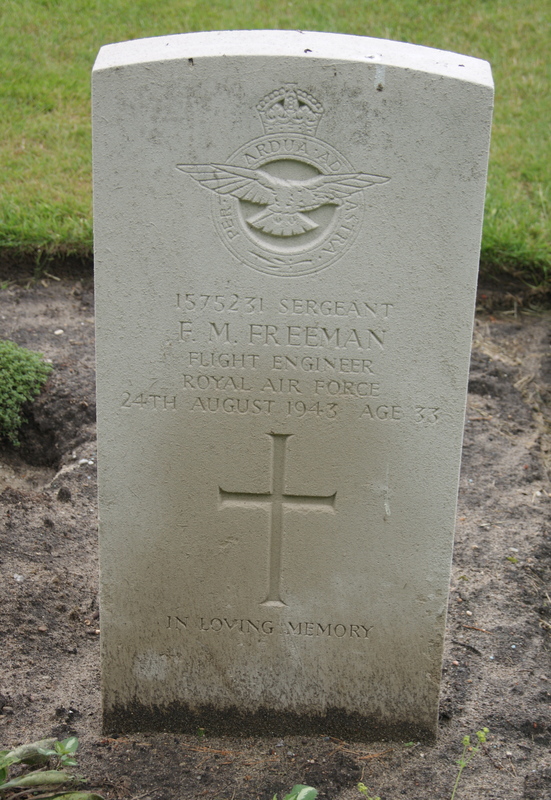 Frank Morris Freeman, RAFVR 1575231 – Flight Engineer. Killed age 33 on the 24tth of August 1943. Son of George and Lily Freeman; Husband of Phyllis Rose Freeman, of Kettering, Northamptonshire. Grave location – 6. B. 28. 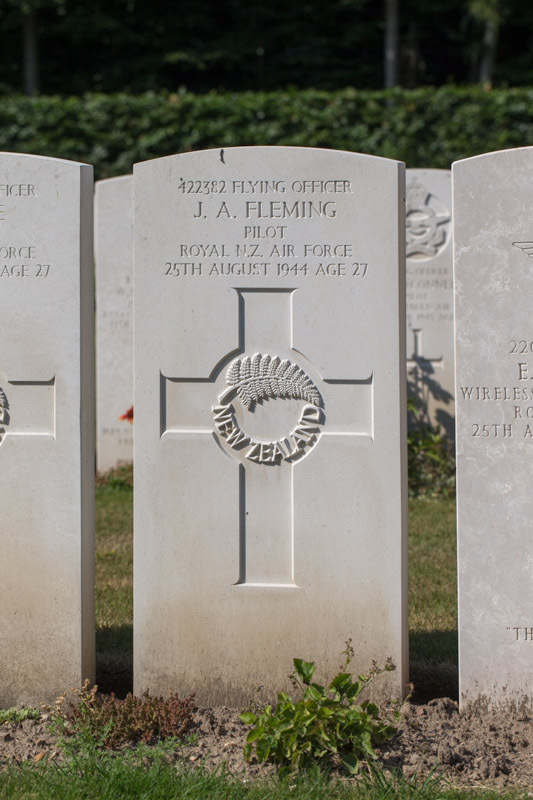 P/O Andrew Rankin, RAFVR 1345194/ 146332 – Pilot. P/O Mervyn Arthur Ericksen, RNZAF NZ416103 – Navigator. F/S James Third, RNZAF NZ422671 – Air Bomber. F/S Frederick William Thorstenson, RNZAF NZ414529 – Wireless Operator. Sgt. D. Catterick, RAFVR 1318470 – Mid Upper Gunner. Sgt. George Ogden, RAFVR 1573298 – Rear Gunner. BF465 was brought down 3 miles South of Lanka, (14 miles North North East of Berlin). All on board were killed except Sgt Catterick, who either parachuted to safety or escaped uninjured from the wreck and was captured as a POW. Those who died were buried in the 1939 – 45 Berlin War Cemetery near where the aircraft came down. Lost without trace age 22 on the 5th of February 1943. Son of George Herbert Freeman and of Patricia Freeman (Nee Pryce). At 19.42hrs – 1hr 32mins after take-off – the crew of the third aircraft, Stirling Mk.I BK617 AA-D, despatched a signal to base indicating they had a further message to report, but none was received. It was later reported that the aircraft was seen to crash in flames just off Cromer, on the Norfolk Coast, on track for base. Nothing further was heard of the crew or the aircraft, although a thorough search was conducted by the Air Sea Rescue service. The circumstances seemed to indicate the likelihood of a catastrophic on-board fire resulting from a possible enemy air attack about 50 miles from the South West end of the Frisian Islands, necessitating an emergency return to base.